Andrew Carnegie – economic reformer? Part of the Geoists in History series, taken from our 112 year old Progress Magazine. Advancing from a dirt-poor Scottish village family to becoming the second-richest man in history (after John D. Rockefeller), the tale of Andrew Carnegie must surely be the most stupendous rags-to-riches story of all time. Yet he gave it all away to become the greatest philanthropist in history, famously exclaiming “the man who dies rich, dies disgraced”. Carnegie was born in Dunfermline, Scotland, in a typical weaver’s cottage with only one main room consisting of half the ground floor which was shared with the neighbouring weaver’s family. The main room would serve as a living room, dining room and bedroom. Carnegie’s mother, fearing for the survival of her family, pushed the family to leave the poverty of Scotland for the possibilities in America. She borrowed 20 pounds she needed to pay the fare for the Atlantic passage and in 1848, when Carnegie was 13, the Carnegies joined relatives in Pennsylvania, then the iron-manufacturing center of the country. Carnegie went to work in a factory earning $1.20 a week as a bobbin boy, changing spools of thread in a cotton mill twelve hours a day, six days a week. Andrew’s father started off working in a cotton mill but then would earn money weaving and peddling linens. His mother earned money by binding shoes. The following year Carnegie found a job as a telegraph messenger and, by virtue of his sharp intellect, started to impress his employers and advance up the ladder. When at age 17 he took a job at the Pennsylvania Railroad in 1853 as the assistant telegrapher to one of the railroad’s top officials, he started taking mental notes about the railroad industry and about business in general. The railroads were the first big businesses in America and Carnegie learned much about management and cost control during these years. Three years later, Carnegie was promoted to superintendent. He was a very hard worker and would memorize all of the locations of Pittsburgh’s businesses and the faces of important men, thus making many connections. Another key to Carnegie’s rapid advancement was his burning desire for self-education, fuelled by a passion for reading. Here he was assisted by a benevolent employer who opened his personal library of 400 volumes to working boys each Saturday night. Can you imagine James Packer doing the same for his junior staff at Crown Casino? Soon Carnegie was backing his commercial observations by investing and reinvesting his profits in railroads, railroad sleeping cars, bridges and oil derricks. He built further wealth as a bond salesman raising money for American enterprise in Europe. The Civil War fuelled the iron industry and, by the time the war was over, Carnegie saw the potential in the field and resigned from Pennsylvania Railroad. It was one of many bold moves that would typify Carnegie’s life in industry and earn him his fortune. He then turned his attention to the Keystone Bridge Company, which worked to replace wooden bridges with stronger iron ones. In three years he had an annual income of $50,000. Carnegie would embrace a new steel refining process to convert huge batches of iron into steel, which was much more flexible than brittle iron. Carnegie threw his own money into the process and even borrowed heavily to build a new steel plant near Pittsburgh. Carnegie was ruthless in keeping down costs and managed by the motto “watch costs and the profits take care of themselves”, indicative of his traditional Scottish frugality. Carnegie built plants around the country, forever using technology and methods that made manufacturing steel easier, faster, and more productive. He was one of the great pioneers of vertical integration as he eventually owned, for every step of the process, exactly what he needed – the raw materials, ships and railroads for transporting the goods, and even coal fields to fuel the steel furnaces. It was this start-to-finish strategy that really catapulted Carnegie to becoming the dominant force in the industry and an immensely wealthy man. In the late 1880s, Carnegie Steel was the largest manufacturer of pig iron, steel rails, and coke in the world. In 1888, Carnegie bought a close rival, which included an extensive plant served by tributary coal and iron fields, a 685 km-long railway, and a line of lake steamships. Carnegie combined his assets and those of his associates in 1892 with the launching of the Carnegie Steel Company. He eventually was worth, in today’s dollars, US$300 billion – that’s five times richer that Bill Gates ever was. But having reached the pinnacle of success in commerce, and seemingly harking back to his humble roots, at the age of 66 he sold all his enterprises to J.P. Morgan in 1901 to devote himself for the rest of his life to giving away his fortune. There were other influences on this extraordinary man. He had a wide circle of talented friends and acquaintances, including the English poet Matthew Arnold and British PM William Gladstone. He was also in correspondence and acquaintance with many of the U.S. Presidents, statesmen, and notable writers. His economic understanding was also assisted by his friendship with the geoists Mark Twain and the English philosopher Herbert Spencer, though we shouldn’t overstate this. 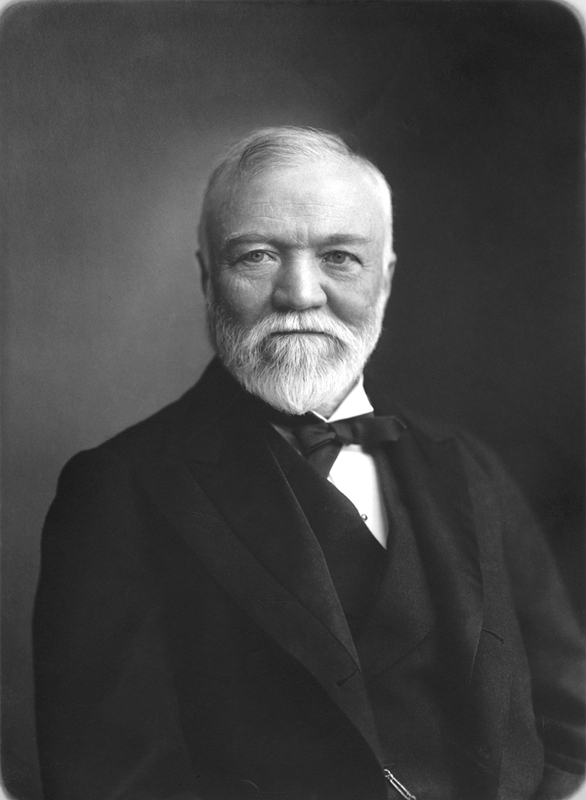 Carnegie also wrote several books and numerous articles, often on the subject of hard work and the need for self-improvement – indeed, his philanthropic work very much centred on helping people help themselves rather than direct handouts. Witnessing the sectarianism and strife in 19th century Scotland caused by religion, Carnegie kept his distance from organized religion and theism. Perhaps it was his poverty-stricken Scottish upbringing that gave him the understanding of the power of land ownership by lords, dukes, barons and earls that led Carnegie to become a strong republican. To this end, in the early 1880s, he purchased numerous newspapers in England, all of which were to advocate the abolition of the monarchy and the establishment of “the British Republic”. Carnegie’s own brand of philanthropy emphasised local libraries, world peace, education and scientific research, mainly in the USA and the UK. He was also a staunch anti-imperialist, and after the Spanish American War Carnegie unsuccessfully offered to donate US$20 million to the Philippines so they could buy their independence. Pursuing his peace ideals, in typical style Carnegie also encouraged the “scientific” investigation of the various causes of war and the adoption of judicial methods that would eventually eliminate them. Carnegie opposed the annexation of Cuba by the United States and in this was successful, and founded an anti-imperialist league. But how are we to reconcile this with the fact that throughout the 1880s and 1890s Carnegie allowed his steel works to fill large orders of armour plate for the building of an enlarged and modernized United States Navy while he opposed American oversea expansion? “Business is business”, shall we conclude? But, aside from the geoist quotes noted in this biog, how clearly had Carnegie “seen the cat”? For one, we can say he understood the concept of economic rent and used it for his own benefit, purchasing iron ore and other natural resources at undervalued prices and creating effective monopolies in a number of industries. But if Carnegie had clearly understood geoist economics, there’d be little doubt that Carnegie the philanthropist would have wholeheartedly supported our reforms, which get to the root cause of the poverty at which his philanthropy was aimed. Carnegie occasionally touched on some real classical economic truths, but then lapsed. He associated Henry George with farmland, not with the valuable locational value of land. He never realised that rents would soon gobble up the technological advances he brought about. He argued that poverty was in part due to millions of dollars that sat idly in bank accounts of a handful of men, not really probing further as to the cause of why that money sat idly. No, Carnegie was a fair way from being a true geoist. Yes, he figured rent was owed to society, but he did not want to pay it while alive – instead, he let his children pay his taxes after his death. While he did give generously to many causes, those causes invariably had the Carnegie name plastered all over them. Ironically, a year after Carnegie’s main efforts in the cause of world peace, World War 1 broke out. This event is said to have shattered Carnegie’s hopes, and precipitated a slide into declining health and death. He died in 1919 aged 83, of bronchial pneumonia. I think I know a way he could have lived to allow him to contently look upwards from his death bed.